Jack and Pam Stewart will present Arkansas Audubon Bird Friendly Yard certification program at our March meeting. They will introduce and explain the criteria required for participation in the Bird Friendly Yard Program. Reminder, starting in March we meet the second Thursday of the month. Many bird species are in decline as a result of habitat reduction, but home yards are capable of supplementing lost habitat. Their presentation will focus on the ecological relationships of plants, birds, and the insects most birds depend on to feed nestlings, and the costs and problems of non-native invasive species. Jack and Pam will also discuss typical hazards around homes, such as windows, lighting, and cats, and show examples of supplementary feeders, water features, and native plant gardens. Pam Stewart has been interested in nature and science since childhood. She has worked at New York Botanical Garden, at nature centers as a naturalist, and taught science in the US and in international schools in five countries. She has co-authored articles in Nature and Science and scientific journals. Since retirement, Pam has been instrumental in invasive plant removal projects within the Buffalo National River. Pam and her husband, Jack, now live in a solar electric home adjacent to the Buffalo National River. Jack Stewart became interested in birds before he was old enough to drive a car. 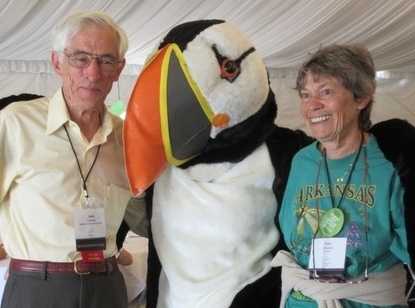 Since retiring Jack has served two terms as President of Arkansas Audubon Society and is currently co-chair of the Education Committee. He is on the board of the National Audubon Society, representing the Mississippi- South Region, is Vice President of Buffalo River Watershed Alliance and is a board member of Buffalo National River Partners. Visitors are welcome, there is no charge. This is also the final week of HSV Audubon’s Bird Supply Sale, so come early to order your birdseed, water trays, and bird nest boxes. Questions call Wayne Krone 501-922-0711 or go to the website hsvbirds.org.